HK-47 is the only character to make appearances in all of the old republic games. He was a companion in Star Wars: Knights of the old Republic one and two but he's also an enemy in Star Wars: The Old Republic. 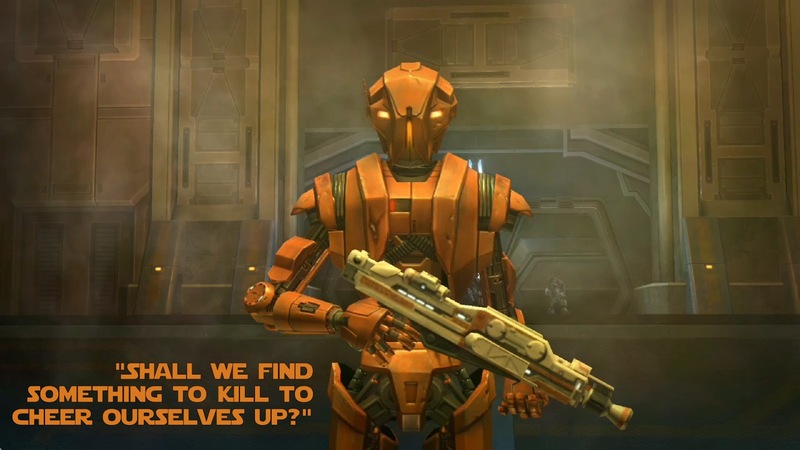 HK is an assassin robot built by Lord Revan when he was the Dark Lord of the sith. When Revan vanished the HK unit was sold on and from there it was sold on and on and on leaving a swath of dead bodies - targets and masters - in his wake. My love of this character goes back to my love of Dexter and of Darth Bane; he's bad. he's a bad bad man who likes to kill things and it's facinating. Yes, OK, in the end he's not so much bad as he is a servant of Revan (who is also baddass) but he's still hilarious. From his inability to call living people anything but 'meatbags' to his love of all things mean and violent HK-47 set the tone for the star wars universe in a way that no other has. Funny but dangerous. Scary but still somehow believable, regardless of the fact that it's a sci-fi creation of metal and death. A good example of HK-47's awesomeness is this wookie-pedia page. It's a list of his best quotes. Peruse at your leisure. 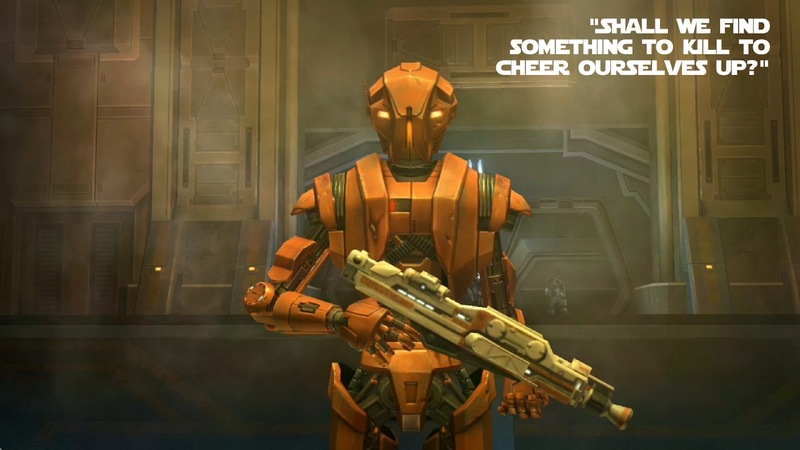 Anyway, if you want to discover HK-47 for yourself you should buy Star Wars: Knights of the Old Republic 1 and Star Wars: Knights of the Old Republic 2 from steam. Well worth owning, and only £6.99 a piece. P.S. The podcast is coming, promise, just got the intro to do, we decided it needs to be more than the one we had. It's coming, promise!